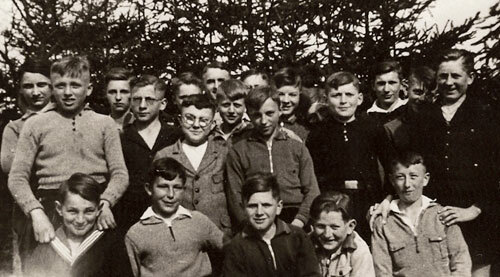 The class of 1935-1936, Themar Volksschule. Source: Rosengarten Collection, VHEC Archives, Vancouver. S.M. Müller Department Store in the Bahnhofstrasse just off the Central Market Square. 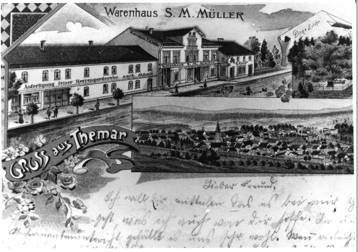 The Müller family was one of the first Jewish families to become established in Themar after 1865. Source: City of Themar Archives. One can talk about a fully established Jewish community, a “Gemeinde,” in Themar from 1865 on. From then until the early 1930s, between 90 and 100 Jews lived in Themar at any given point of time. This was about 3% of the population in the first decades of the 19th century; the rest of the city’s population was overwhelmingly Protestant as any Catholics had left much earlier. Initially (1865-70), the community met in a small rented room in the house of master shoemaker Blau on the Werra Bridge. In 1870, a room in the second floor of the home of Abraham Walther at Hindenburgstrasse 17 (later Oberstadt Strasse and now Ernst-Thälmannstrasse) became both a prayer and a school room. In 1877, the dedication of a synagogue marked the formal establishment of a “community.” In 1894 the lower floor of the Oberstadt Strasse house was purchased, and a Jewish school with a teacher’s apartment was installed. It’s highly possibly that the community had a Mikve in Themar and the dead were buried in the Jewish cemetery of Marisfeld. Jewish merchants played a strong role in Themar’s economic, social, and political life. They handled most of the local textile and livestock business (cattle, goats, horses) and distributed goods to the neighbouring villages. Many were members of local civic and sport clubs. In 1913, one of the leaders of the Jewish communities was elected a member of the municipal council. 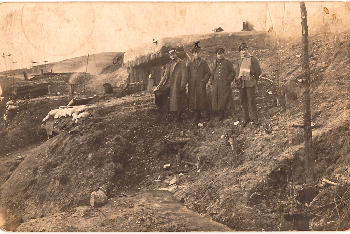 Paul Rosengarten on the East Front, WWWI, 1917. Paul, who was born in 1893 in Herbede in the west part of Germany, came to Themar after the war and married Berta Schwab, daughter of Abraham and Regina Epstein Schwab. Source: Rosengarten Collection, VHEC Archives, Vancouver. In 1914, at the outbreak of WWI, 550,000 Jews lived in Germany. Of these, 100,000 — that is, 20%, and every second eligible male — fought on behalf of his country; 12,000 paid with his life. Our current research identifies thirty-two (32) members of Themar’s Jewish families who fought in World War 1. Eleven of these were men in Themar: Herbert Gassenheimer; Julius, Leonard, and Friedrich (Fritz) Daniel Kahn; Moritz Levinstein, Max Müller II, Paul Rosengarten, Markus Rosenberg, Louis Sander, Max Steindler, and Hermann Stern. Of these, two, brothers Leonhard and Friedrich Kahn, died; one, Hermann Stern, had a leg amputated; and three — Moritz Levinstein, Max Müller II and Markus Rosenberg — were awarded the Honorary Iron Cross for Front Fighters. In the post-WWI years, the Themar Jews resumed their pre-war activities, and participated actively in party politics and elections. The surge in popularity of the NSDAP in Thüringen starting in 1925, however, brought increasing threat to all Jewish communities in the state. For a vivid description of life in Themar in the 1920s and early 1930s, as seen through the eyes of a boy growing up then, see Manfred Rosengarten’s, Themar, Thüringen: My Hometown, written in 1983. And then came January 30, 1933 and the world of the Jewish community of Themar changed forever. Karl-Heinz Roß & Hans Nothnagel, “Die jüdische Gemeinde Themar — ein fragmentarischer Rückblick,” in H. Nothnagel, Hg., Juden in Südthüringen: geschützt und gejagt (Verlag Buchhaus Suhl, 1995), Bd. 2. Hans Jurgen Salier, Themar: Geschichte in Daten (2008).